A few days ago I was driving through King and saw a barn that I had seen some time before. I wasn't able to do much with it at that time because it was completely overgrown with vines and weeds. However, this last time I drove by, I noticed that not only were the weeds gone, the siding had been stripped off of the shell as well. 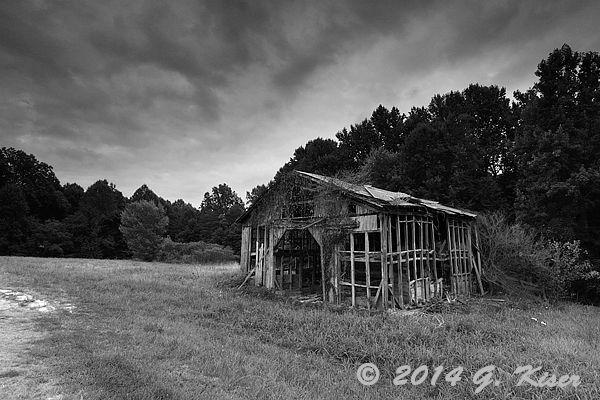 This was a little odd to see a barn at this stage and it made it rather interesting to me. I wanted to come back at a time when the sky was interesting, without waiting too long in case they were coming back out to finish the removal of wood. Based on the forecast and what I had been watching the sky do all day long, I thought that I might have a good chance at getting some interest in the sky after work. Without giving it much thought, I went ahead and loaded the camera up and headed out to King. When I got there, the sky was a little bit blah on the side that I was interested in, and much more interesting on the other side. I decided to shoot from both sides and see what I could come up with. I started with my 24-70mm which is a great lens for shooting barns, but for some reason, I wasn't getting the "look" I wanted with this one. I needed something more dramatic, so I swapped the lens for a 16-35mm for a little more perspective distortion and a sweeping feel. I added a 3-Stop ND Grad to round out the optics to help keep the detail in the sky. Against my better judgement I spent some time on the left side of the barn which put the sun in the background, as well as power lines, and a newer house. There was also the street and a street sign. These are usually very big no nos in my photography. However, this time they seemed to play a certain role in showing the age of the old barn. It was in that juxtaposition of physical conditions that I found a nice balance to the image. It's still one that breaks my mold quite a bit, but sometimes it pays to work outside of one's comfort zone. 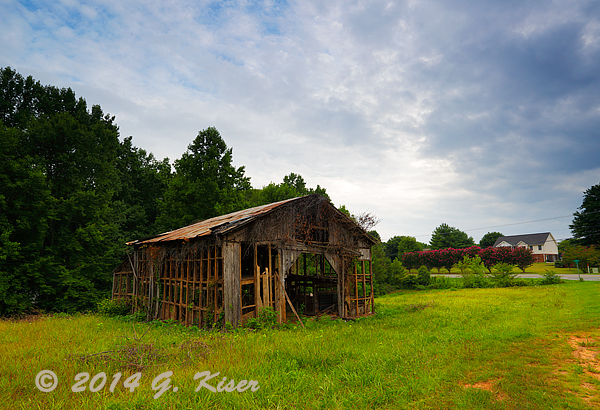 The better lighting was from the other side of the barn, but the trade off was a much less interesting sky to work with. The ND Grad helped a bit, but I needed something to punch up the contrast even more. I started to think in terms of black and white and I could see the tonalities working rather well in that visual realm. I shot the scene in color, but I had full intentions on converting to monochrome and applying a red filter to boost the contrast a good bit. I think that black and white really suites this subject with the current conditions. There is so much really great texture to be examined throughout the image that it almost seems to be a waste to clog up the visual receptors with all the color. I really think that this is the best side of the barn, and one that does hold its own in a composition consisting mainly of just the barn. There is just so much to look at, whether it is looking beyond the framework to the inside, or looking at the vines that are still clinging to the fascia above the doorway. Even the roof offers several layers of texture standing out against the deep tones of the trees in the background. While this isn't the image that I set out to capture, I have to admit, I really like this one. It is the one that I am most satisfied with I believe. There are Treks that are planned for months, there are treks that are planned because of the weather at the time, and there are treks that are not planned at all. Tonight was one of those treks that wasn't really planned at all. Well....that wasn't entirely true. I have scoped this location out before, and even shot many a frame here before. I have been thinking about going out and giving it another try using a technique called painting with light. So I guess you could say that this was planned, but the actual part where I got up and went was unplanned. Toni got called into work for a few extra hours this afternoon, and I decided to go in and lend a hand to help out. I figured that when we would be done, it would be about dark, and we would have to come back past Magnolia Manor anyway. With that in mind, I loaded up the camera, and a flashlight along with the tripod and we went to work. We got done with work a little early, stopped to get a bite to eat and then it was out to the location to get set up. I still had plenty of daylight left and I had plenty of time to find my compositions and get the camera set up for the first one. Things went very smooth, and we actually found ourselves sitting and waiting for over an hour before the lighting got just right...and by just right, I mean waiting for it to almost go away completely. There was a good bit of sky visible behind the tree and I needed it to render a color other than white. Using a minimum of a 30 second exposure made that rather difficult to say the least. So, what exactly is painting with light? 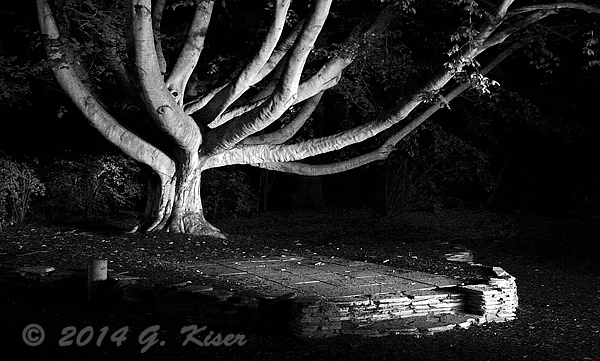 Simply put, it is the practice of using a light source to illuminate exactly what you want to during the exposure. Sunlight is broad reaching and will illuminate evenly except for shadows. When I paint with light, I am adding light to precisely what I am wanting, and at the intensity that I am wanting. The really cool thing about this technique is, no matter how many times I trip the shutter, I will always get a different image. Its a creative technique that just can't be readily duplicated. 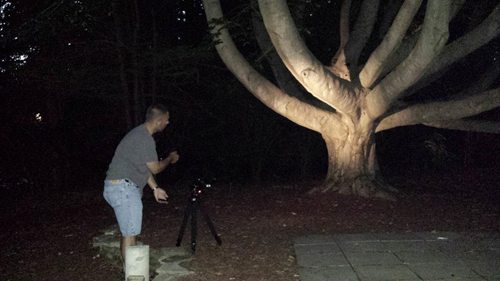 As you see in the picture above, I was using a maglite to "paint" the tree in nearly dark conditions. While using a long shutter speed, 30-90 seconds in this case, I was able to paint light where I wanted it on both the foreground and the background. I was able to control where the shadows were, and what appeared the brightest. My first composition focused on the rather unique structure of the tree. This is what has made this a favorite portrait setting for when Toni and I did portrait shoots years ago. The branches are strong and each one seems to dominate the other. There is a level of complexity here that is just not normally seen in trees around here. Because of that, I really wanted to focus on just that quality. To do that effectively though, I needed to get low to the ground and shoot up. Obviously, the sky was shining through the leaves above which during the day would have left me with bright white areas that were blown out. 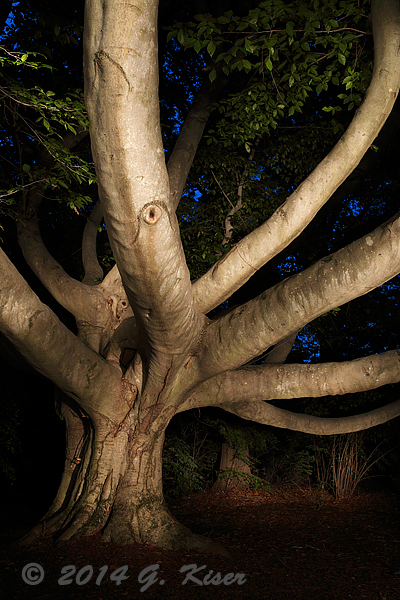 In order to get the sky to appear blue, and to have a good exposure on the trunk, I was left with only one good option, and that was to wait until the blue hour (the hour after sunset) to paint the tree with light, while exposing the sky as a deep blue color. It took several exposure to figure out just where I needed to put the light, but once I did, I was able to get the image that I had in mind with about a minute exposure. In that 60 seconds, I lit the tree from two different places, one on either side of the camera. This is another benefit to this type of photography, I choose the direction that each element gets lit from. Talk about complete control! 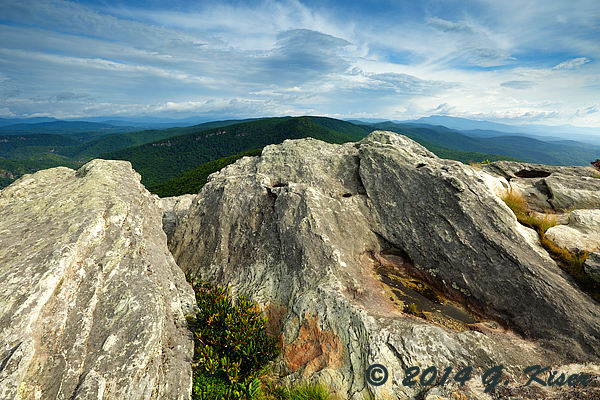 From there, once I was satisfied with my image, I moved to my secondary location which took in much more of the scene. The tree was now going to become just an element in a larger composition as opposed to the sole focus of the composition. For this, I wasn't as concerned with the sky because I would be shooting from an elevated position, and there would be much less sky showing through the branches. As you can see here, the tree has a nice little platform built out to the front of it. With the long reaching branches on the right, I chose a position to the left of the entrance to let the platform balance out the longer limbs. When I framed the shot, I knew I had it spot on with what I was seeing in my mind. It was getting quite a bit darker, so my exposures were getting longer and longer. I shot as long as 90 seconds on some of the shots, but nothing was under a minute. This gave me time to really paint the scene slowly and meticulously. One thing that I realized about midway through my session from this location was that the tree seemed to benefit from me lighting it off to the right. This provided a strong sense of side light, and a lot more visual drama. I was going for an image that send shivers down a spine, and this lighting was looking to give the best chance. When I got home, I started to fight with color temperature and such, only to find that I wasn't overly happy with any of them. Something was missing, I just wasn't sure what. On purely a whim, I decided to go in and do a monochrome conversion to bypass the whole color dispute I was going through with myself. At first, I was mildly excited with the outcome, but when I started to adjust how the tonalities were relating to each other, I saw much more potential. Ironically, I applied a preset for infrared to the image, and the tree and stone steps seemed to jump from the background. The shadows became much more intense, and the feel of the picture....well....gave me shivers. This was what I was going after with the image all along. I abandoned my color information and decided to make this a dedicated monochrome image. Of the two images that I shot tonight, I think that this one is my favorite of the two simply because it captured the mood so well. It wasn't a long trek, and it was one that kind of fit in with other things going on today, but I have to say, I'm glad that Toni and I decided to give it a try on the way home. We both had a lot of fun working the scene, even though there was a lot of just standing around waiting for the sun to go down. Its been far too long since I have gone and done a long duration Trek in the mountains. It seems that I have only been able to get out there for a few hours at a time. While that has yielded some really good pictures, I have not had the time to work on any sunrises, or to hit multiple locations that require hikes. There were several places in the Pisgah National Forest that I have been wanting to go for a while now, and I decided that today would be the day. The first order of business would be a possible sunrise since the weather was calling for 45% cloud cover, and I wanted to get back to the Brown Mountain Overlook where I had done an impromptu sunrise shoot some years ago. The problem with doing a sunrise set this time of year was that sunrise was happening shortly after 6am, which meant that I would need to be there no later than 5:45am. Since the overlook is about 2.5 hours away, I started to do some math and realized that I was going to be waking up at 2:15 in the morning. Hmmmm, that is more like a time to go to sleep than to wake up...but that is part of being a photographer I suppose. I started the night before going to sleep while it was still light outside, and well before my 9 year old's bedtime. There was just something wrong with that! I didn't sleep all that great since I was preparing myself to need to wake up that early. Somehow though, I did manage to get a fair amount of sleep and when the alarm rang at that unholy time, I was able to get up and start my day. Of course, I did check the weather first before I got up. It was holding steady with 45% cloud cover till about 8am, and then increasing to 70%. My plan was to do the sunrise set, and then move on to work a couple of waterfalls, namely Roaring Fork Falls and Crabtree Falls. The drive out to the mountains was uneventful except for the fact that I remembered incorrectly that Hwy 181 intersected with I40. Needless to say, I missed the exits I should have taken, and had to consult with my GPS to get back on track. I ended up taking about a 50 mile detour because I didn't plan the way I should have. Fortunately, I left early enough that I could handle a problem or two on the way. I no longer had any extra time to play with so I was really hoping that the rest of the drive was smoother and more direct. I guess my leaving a little early paid off because I arrived at the overlook at 5:30, right when I was wanting to. I was a little disappointed though because while driving up Hwy 181 I was starting to get rained on a little bit. It wasn't much, but it did indicate that the cloud cover would probably be too much for the sun to peak through. Oh well, I was here, might as well pull off and rest until daylight when I could start working on the waterfalls. As luck would have it though, shortly after pulling in, the clouds started to break over Chestnut Mountain and I saw an opportunity. I quickly set the camera up, but with a very different composition in mind from what I was anticipating. The weeds had overgrown the edge of the parking lot and obscured the valley below that I was looking forward to capturing. Instead, I decided to fit my 70-200mm lens and use the tops of the mountains as my visual anchor and concentrate on the sky. As I started to dial in my compositions and exposures, the sky continued to open up, and I could see that the clouds were at several different altitudes. This was really good news because that meant that there was a good chance I would get some color in the morning sky. There was a lot of color to be had in the upper elevations, but there was a very thick bank of clouds that was looming on top of the mountains and continuing out to the horizon. This effectively blocked most of the color that would appear close to the mountains, so I really had to be careful with my compositions in order to keep everything unified. I probably shot nearly 60 frames of the sunrise since I wasn't sure how good it was going to get and I didn't want to miss the peak colors. Surprisingly, I got a good bit more color than I was expecting from how I was watching the sunrise unfold. It wasn't what I had in mind, but it was very much worth getting up early and making the drive to see this one. With the sunrise over it was time to figure out my next step. I had been planning on going to Roaring Fork Falls, but the way the sky was looking, I really hated to waste the textures by shooting waterfalls. The clouds at various altitudes called for some grand landscapes. I had an alternate plan in my back pocket and decided that I would move forward with that plan. 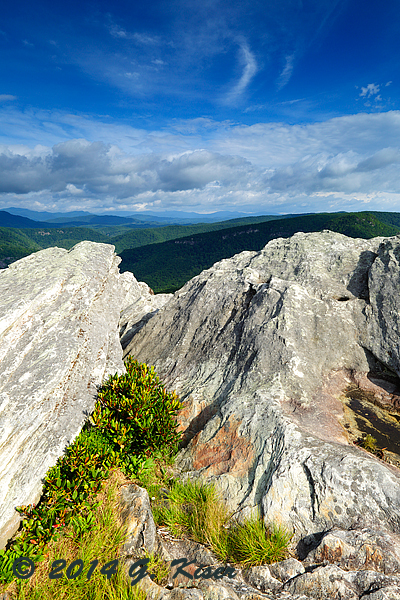 I was off to Hawksbill Mountain. 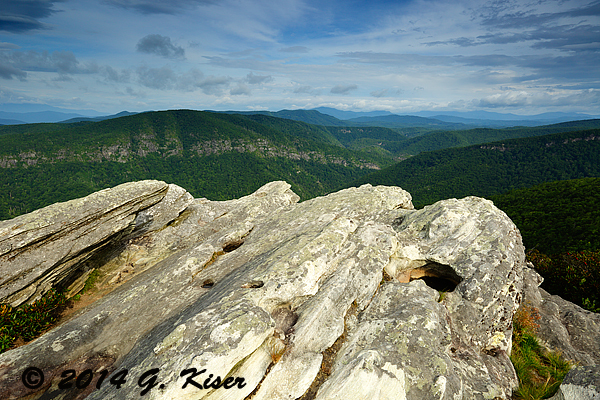 Its been a number of years since I have hiked Hawksbill. The last time it was a mostly sunny day, and I did it after hiking Table Top so I was there at the middle of the day. The weather conditions were far from favorable that time, and I have been wanting to try it again for some time. The clouds I was seeing were setting the stage for what I thought was going to be a perfect opportunity for a return visit to Hawksbill. I wasn't impressed enough with Table Top to want to go back today. 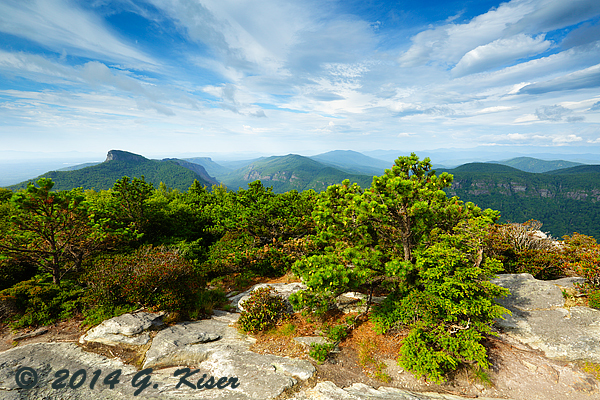 I was less than 10 miles away from Hawksbill, so the drive over there took no time at all. The only delay came from the slow speeds needed for the forest service road I had to drive down to get to the trailhead. Even so, I was ready to start my hike around 7:30 or so. It was hard to tell what the sky was doing from beneath the canopy, but I was convinced the clouds were going to remain as I had seen them, at least for a little while. I set off with a purpose and started the mile hike. While a mile isn't that hard to cover, this is a rather strenuous trail and it represents about 1000 feet of climbing in that mile. There are also no markers for the trail and several places that you just kind of guess at which direction to turn. Somehow though, I managed to make it to the top without getting lost. I was very happy to see that the clouds were still overhead, but they quickly became a secondary concern for me. The minute I left the shelter of the trail, I was assaulted by winds that could only be described as tornadic! To the best of estimation, I would say that the sustained winds were around 20mph, with gusts nearing 30mph. This presents so many problems for a photographer I was starting to wonder if it would be worth staying or not. On the plus side, I had some amazing skies to work with. I was in a place that I haven't had much of an opportunity to shoot before, so it was new. I was also alone, which is always a nice thing for a landscape photographer who doesn't want a bunch of people in his pictures. On the negative side, trees, grass, and bushes were going to be very blurred unless I timed my exposure just right. I was going to have a hard time keeping dust off of the front element of the camera. I was going to have a hard time keeping the camera steady on the tripod to ensure sharp images, and in fact I was going to have a hard time keeping the camera upright. I've been through gusty conditions before, and have damaged a lens when the tripod toppled over. Lastly, with the gusts, I was actually worried about keeping my own balance. My hat was already trying to blow off of my head! I decided to go down to the lower section and hope that the wind was blocked a little bit so I could get the camera built and on the tripod. Knowing that I wanted to include sweeping views of the sky where I could, I opted to work with my 16-35mm wide angle lens along with my Lee Filter Holder. I used several of my ND Grad filters to keep the exposures under control and make the most out of the beautiful sky above. I managed to get everything put together, but I could tell that the camera wasn't going to be very stable. Where I could, I kept the legs spread out very wide for a bit of extra stability. I kept one hand for the camera, and one hand for my hat. The exposures became waiting games for when the winds would die down for a brief time and allow my to press the shutter release. I found myself rattling off a bunch of exposures trying to make sure that I got usable images without a lot of motion blur in them. I would check in the LCD, but it is very hard to determine if a bush is blowing in the wind by looking at a 3" screen. All I could really do was hope that I was capturing images at the right time. In addition to the vegetation blowing, I could tell that the wind was causing all sorts of vibrations in the camera. I ended up having to apply pressure on the tripod to help keep it stable. Of course, this is not a great way of doing business, but it was a lot better than the alternative today. As I realized that I had reached the end of my options in the lower section, I grabbed by bag and carried the camera up to the upper section. It didn't seem as windy up there as it did before. I decided to give it a go and see what I could find to work with. Because of the sky conditions on my last visit, I had not done any photography on this section, so it was all new to me today. I found all sorts of compositions, and kept putting my anti-wind techniques to use in order to execute my ideas. There were a few compositions that I wanted that would have put me close to the edge. Under normal circumstances, I would not have thought twice about doing that. However, with the wind the way it was today, I stayed clear from the edges. I'm sure this was a very good idea since more than once, I was knocked off balance by a particularly strong gust of wind. My compositions were a game of cat and mouse. I kept looking for that moment when the sun was providing the right light and the wind was calm. These moments came very far between, and only occasionally was I able to take advantage of those times. Most of what I did was sit and wait...and wait....and wait. Waiting wasn't so bad though. The scenery was beautiful, and visibility was much better than my last visit here so I was able to really enjoy being here. 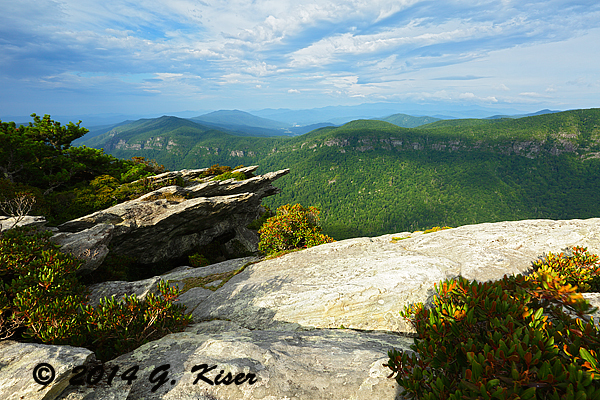 The Linville Gorge has been called the Grand Canyon of the East, and I can honestly see that when looking down from Hawksbill Mountain. 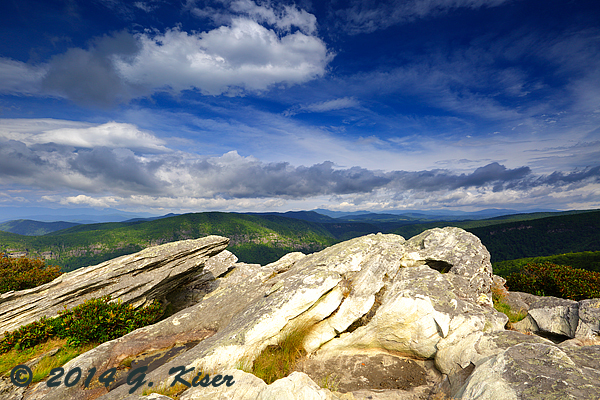 The rugged terrain below is amplified with the rock outcroppings at the top of the mountain. It all just fit together so nicely. everywhere I looked I saw a sight worth capturing with the camera...except for one. Looking toward Table Rock the sky was totally washed out with clouds. 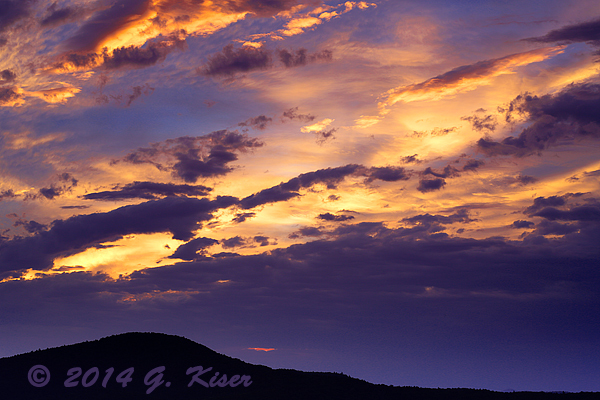 While the mountain ranges looked awesome, the sky took away that wow factor and kept me from photographing it. While I was eating my snack, I got excited to see that the clouds were clearing from the other end of the mountain top. I was going to be able to capture the distant mountain range. Typically, I would want to get a little bit of a longer lens to capture distant mountains, but in this situation, there was plenty of definition in the individual mountains, and I had the opportunity to include some of the vegetation and rock floor as a foreground. 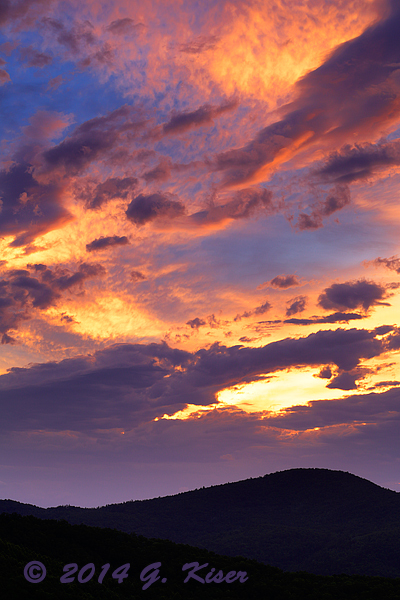 the 2-Stop ND Grad was the perfect addition to the sky and the blues popped out as if I was using a polarizer. I was thrilled to have gotten this view after thinking the sky wouldn't cooperate with me. As with my other favorite rocky mountain, Stone Mountain, I was fascinated with the ability of the vegetation to latch on and grow in some of the strangest areas. I had the chance to photograph just such a setting when I noticed that the clouds were starting to make some interesting shapes above some of the vegetation. It was almost a pastel crescent moon, when the rest of the clouds seemed to be in a uniform, horizontal fashion. I just loved how this picture seems to go on for miles and miles and miles. This is a magical place, despite the winds. I could see just laying on my back staring up at the sky and pondering the meanings of the universe. While I didn't do just that, I did find myself thinking a lot. It felt good to let my mind wander a little bit. As it turned out, I saw a group of cloud formations that just seemed to sum up what I was just talking about. There were the normal puffy clouds, but even more interesting was the swirl that was spinning off to the right. 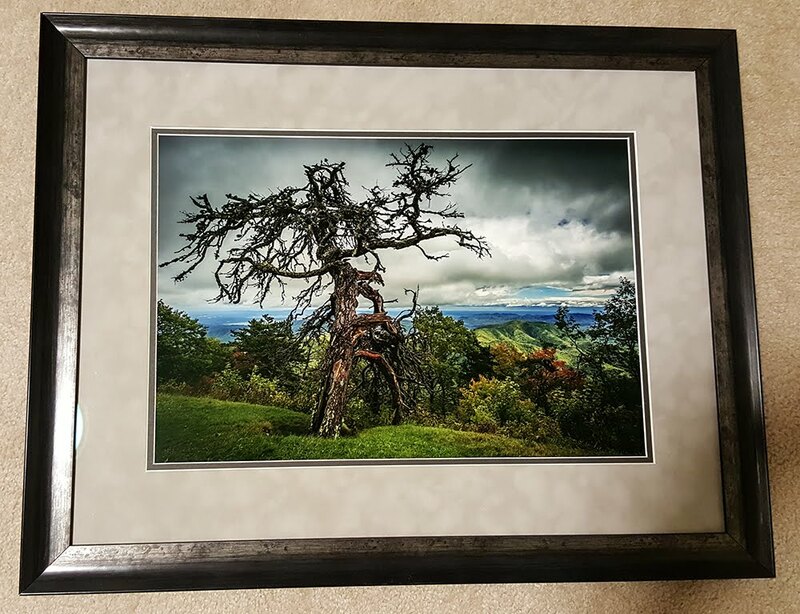 I went ahead and framed up a quick composition before the moment was passed. As it turned out, I was facing North, and even though I wasn't using a polarizer, the ND-Grad added enough density to the blue sky to really make it pop against the lighter tones of the clouds. Shortly after capturing this image the winds started up again, only this time it was so strong, I didn't want to let the tripod go for fear that the wind would knock it over. 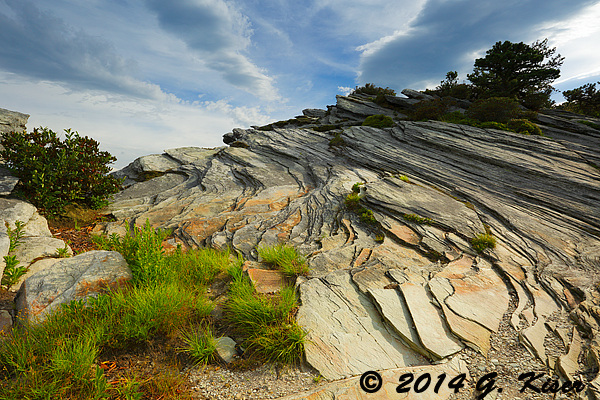 To illustrate the point, I had my camera bag (35lbs) laying on its back against a rock. A gust of wind came along and stood it up like it was nothing. That was my clue to hide out from the wind and pack it all up to head back to the truck. The hike back was a little more interesting than the hike up. Remember, the trails are not marked, and there are quite a few places where you have to guess at which turn to take? Well, I chose wrong on a number of turns, and got myself very turned around at the beginning of the return hike. Fortunately, I was able to locate the trail make my way back to the truck. When I got back, the clouds were moving in again, and the lighting was looking pretty good for working a waterfall or two. I opted to go to Crabtree Falls which was closer than the Roaring Fork Falls. My intention was to ultimately do both, but I wanted to get the larger one first. When I arrived at the parking lot, there were more cars there than I recall ever seeing before. This was not a good sign since I don't really like putting people in my pictures. I decided to give it a try anyway since I was here, and here was a long way from home. The hike was not bad, but it was about 1.2 miles which was a lot after doing the hike to Hawksbill just a little earlier. At least this was downhill, so it wasn't wearing me out too bad. However, I knew that the hike back would not be fun at all. When I arrived at the falls, there were people in the water, lining the bridge, and off on the shoulders of the water. This wasn't good at all. I was hoping that they were all there for a short time. With that hope, I went ahead and started to set up my shot. I kept my 16-35mm lens on, and added my polarizer as well as the vario-ND filter. It took some time to set the first shot up, and even longer for the people to clear the area. 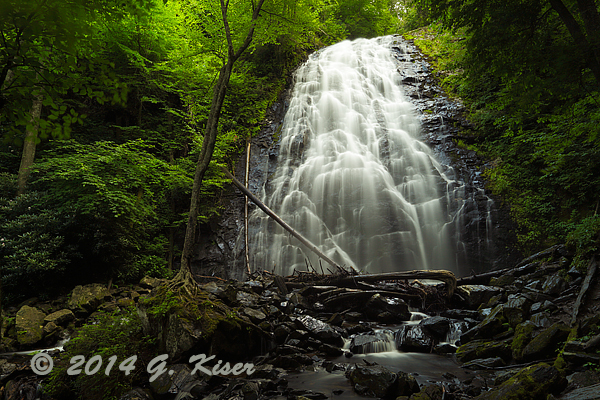 This is the main reason I don't care for photographing waterfalls in the summer. Crabtree Falls in one of the more impressive cascades in the area. Its a very large waterfall, and seems to always have a good deal of water flowing over the rocks. Unfortunately, the constant forceful flow tends to sweep a lot of debris down to the bottom of the falls. 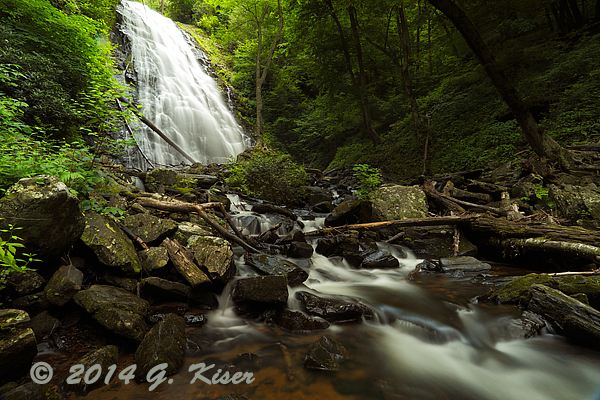 This clutter isn't my favorite aspect, but it does help to tell the story of the waterfall. One of the neat things about this waterfall is that it can easily be photographed from either side. With the delicate cascades, it just about begs for the postcard shot where it fills the frame. I could get lost looking at the designs that the water makes as it slides down the face of the falls. When I was finished with Crabtree Falls, I started my hike back to the truck. The return hike was all uphill, and really made me realize just how tired I was getting. I had to make several stops to catch my breath before continuing. 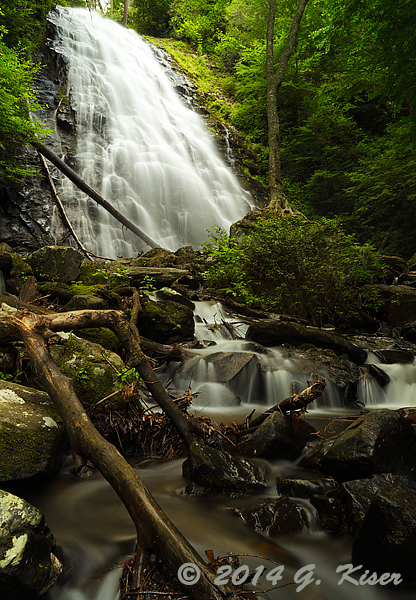 Despite that, I opted to continue on to Roaring Fork Falls and get some new images of that cascade. It was only about 10 miles away so I wasn't driving long before I got there and found a half dozen cars in the parking area. Knowing this waterfall as I do, I could tell that there would be no sense in trying to hike out there for pictures. This is one of those waterfalls where people swim, climb, and just hang out for hours. I decided it would be better to come back at a later time. That was fine, I had 175 images that I needed to get processed, and I needed to get home. 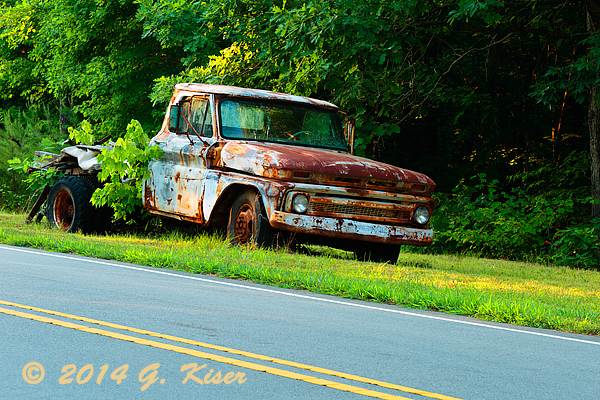 Several months ago I was driving through the edge of Walnut Cove and came across an old Chevrolet pickup on the side of the road. It caught my eye enough to get me to turn around and knock on the door of the house near where it was parked. There was no answer that day, and that meant no pictures since I was pretty sure I would need to get in close to it for the images that I wanted. Even though I didn't shoot the truck that day, I filed it away in my mind for later. As it turned out, a friend of mine from work was telling me about an old truck out where he lived that he would like to see me work with. The more we talked the more I realized that the truck that he was talking about was the same truck I had seen not that long ago. 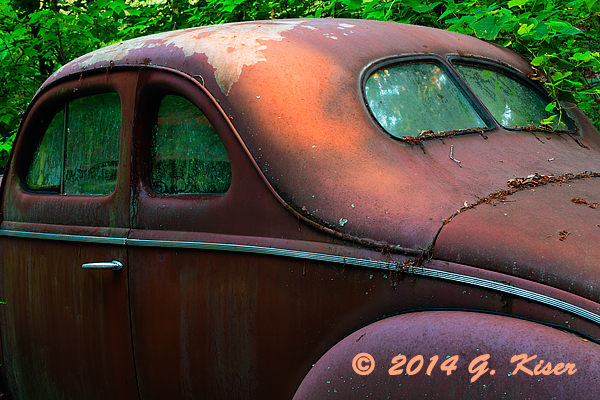 He said that he could get in touch with the owner and see if he would mind if I stopped by some day to photograph it. 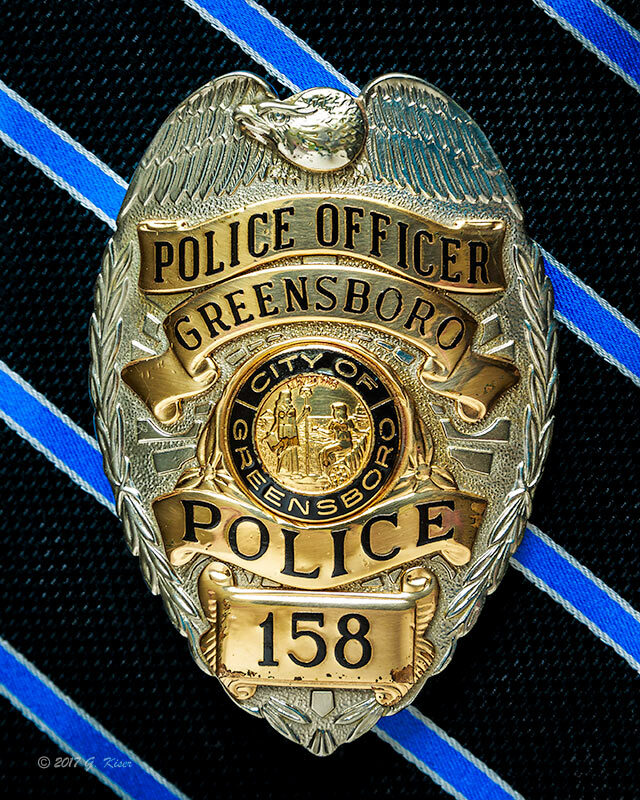 It took a while, but he was eventually able to locate the owner and gained the permission that I needed. It had been some time since I had looked at this truck and wasn't exactly sure what conditions I would need to make good photos. Looking at the map, I speculated that the setting sun would provide the best light for the truck the way it was situated alongside the road. Since I wasn't able to get out last week for any photography, I opted to go out after my last day of work for the week and give it a try. When I arrived, I figured it would be the polite thing to do to introduce myself to the owner if he was at home. I knocked, and surprisingly, the door opened. I introduced myself, and it took a few seconds for what I was saying to register with him. I was wondering if I had the right truck. He did eventually recall the conversation and he gladly gave me permission to work the truck as I saw fit. I quickly got set up and started to work on compositions. These compositions were not the easiest to formulate either. I had power lines above the truck, and a roadway to the left of it. I was restricted on where I could shoot, and from what angles as well. 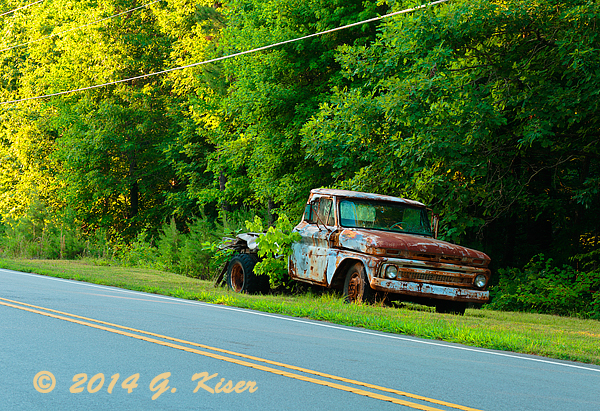 I started out up close to the truck with my 24-70mm lens with an enhancing polarizer attached. I was pretty happy with what I was seeing, but the images were all following my same basic formulas. I wanted something a little different, so I decided to step out of my comfort zone and include the roadway, and eventually even the power lines above in different compositions. To do this, I opted to swap lenses to my 70-200mm which gave me more compositional control from the distance I was shooting. 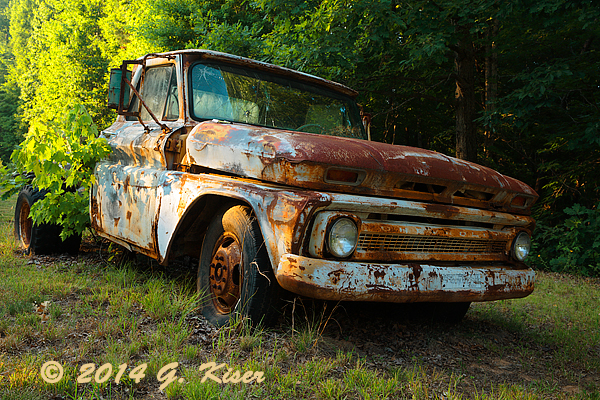 I had about 20 frames taken of this old truck from various locations. Of these I found three that I particularly liked. They are each very individual images that I think say completely different things with their compositions. In a serious break from my normal rule of no power lines, The Road Less Traveled embraces the power lines as a counter element to the double yellow line in the foreground. The angles actually help to keep the eyes in the frame and focused on the truck. With the light fading, I started to work my way back to the truck talking with the property owner the whole way. He started to tell me about a 40's coupe that he had in the back yard. JACKPOT!!!! Or so I thought. I asked if I could take a look and he started down the hill to where his other cars were at. I quickly saw the coupe, but saw that it was sandwiched between two other cars which were in very close proximity. I wasn't sure I was going to be able to get anything at all because of all the clutter. However, while I was getting a little bit of the back story on this car, I started to concentrate on the curves around the cabin. I still had the long lens attached, so I was going to be able to pick out details on the car fairly easily. I framed a shot that captured the curves I found so interesting. While its not the shot I really wanted, It had a certain abstract quality to it that kept my interest. I found myself wishing that this car was in worse shape. The body was actually very good, and the patina was a little bit uniform for my tastes, but I had to grab the opportunity to shoot this one while I had the chance since this body style is kind of hard to come by. It was a quick Trek, and one that wasn't planned out all that well, but I think it was a success overall with four keepers from the day. My intention was to continue on and do some light painting with landscapes just before twilight, but I stayed at this location longer than I anticipated. Hopefully, later in my set of off days I'll have another opportunity to go out and try something different.